Tour Of the Dragon & Dragon’s Fury are both one day mountain Biking races. Tour of the Dragon is a 268 kilometers one day race starting in Bumthang, in central Bhutan. Join dozens of mountain bikers (mainly Bhutanese, some visitors and some ExPats) in this epic Tour of the Dragon race starting in Bumthang (2610m /8560 Feet) for 268 kilometers west traversing 4 mountain passes (highest point) 3434meters /11,250 feet). Around 50 bikers are expected to participate in this race. The race is planned to start at 1AM on Sept 3, 2016. Registration Fees is US$250. Participants receive medal, certificate and may be some cash prices. Bumthang -Trongsa: Riders follow the Bumthang chhu (river in Dzongkha) for a couple of kilometers and then climb 6km through blue pine forest to Kiki La at 2870m (9420 ft). From there it is down to Nangar, through more blue pine forest and agricultural land , pass through Chumey and up to Gaytsha (2950m, 9680ft). The road then climbs 7 km up through blue pine forest to Bong Bridge and then gets a little steeper for about 5 km through mixed conifer and rhododendron forests and pastures till you reach Yotongla at 3430m (11250 ft). 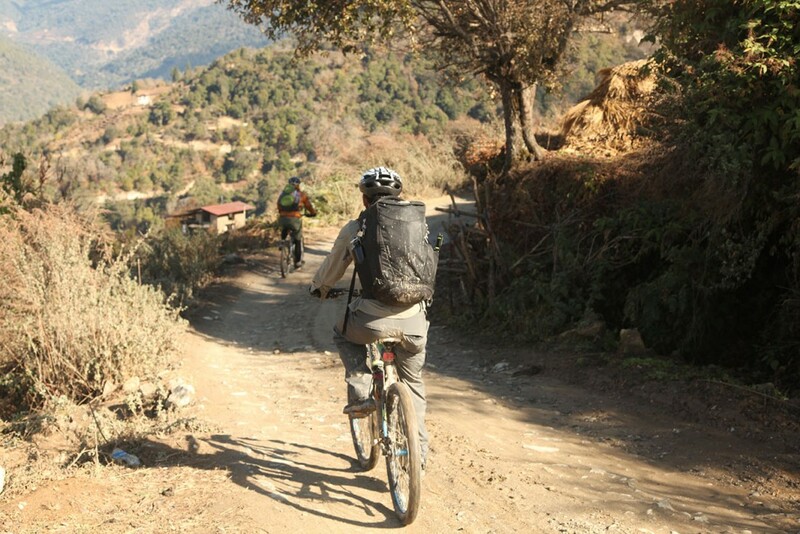 From Yotongla it is a 29 km downhill ride to Trongsa. Soon the firs give way to spruce and hemlock and mixed broadleaved forest dominated by birch and oaks and rhododendrons. There are some excellent viewpoints to see Trongsa, the Dzong and the extensive forests and agricultural fields beyond. Just before reaching Trongsa (2150m, 7050ft) you pass right below the Ta Dzong Watchtower. Trongsa to Wangdue -Metsina: From Trongsa the road descend gently for 7 km to the Bjee Zam bridge at 1900m (6230 ft) and then climbs 6 km through broadleaved forest to a view point from where you can look back at Trongsa Dzong. The road continues climbing for another 10km along cliffs and through broadleaved forests and agricultural settlements. At Tshangkha it passes the headquarters of the Jigme Singye Wangchuk National Park. After reaching Tashiling, a few km further, most of the climbing is done. For the last 20km you will only climb some 150m (500 ft), but there are some ups and downs. As you near Chendebji, hemlock replaces broadleaved species on some of the ridges and in the valley. You pass Chendebji chorten and a little later will reach Chendebji village (2430m, 7970 ft). The road climbs through mixed conifer forest past Nikachu bridge at Chazam and Rukubji to the small settlement of Longte. By this time much of the trees have been replaced by pastures and agricultural fields. Through these pastures dominated by dwarf bamboo you reach Pelela (3430m, 11250 ft). You then continue your long descent through fir, birch, rhododendron forest and many small waterfalls to Wangdue Phodrang. After passing the village of Nobding, 12 km down, there is a single restaurant a further 12 km down and then a few shops at Teki Zampa another 15 km further. Just past here a new Japanese bridge spans the Dang Chhu. At Chuzomsa, there is a side road to an abandoned slate mine. After a long almost flat stretch you reach Wangdue Phodrang. From Wangdue Phodrang, you continue to Metshina, an altitude of 1410m (4625 ft). Metshina -Dochula-Thimphu : From Metshina, the distance to Dochula at 3150m (10,330 ft) is 38.3 km and the race is all uphill with an average slope of 5% and a few short sections of up to 10%. You will pass Thinleygang (11 km), Lumitsawa (15km), Lampiri (28km) and a memorial chorten (32km). Racing 1700 m (5575 ft) uphill is as breathtaking as the views. After Dochula, it all downhill to Thimphu at 2330 m (7640 ft) with a small climb only at the end to the Thimphu city square. Aid stations are located approximately 20Kms apart. Aid stations will feature water, fruit, and other nutrition. There will be six mobile aid cars roving along the route with food supplements basic medical kit and one technical personnel for minor bike repairs. Traffic will be open to vehicles, but will be monitored by local police. There will be intermittent and undisclosed checkpoints along the course where you will check in with timing personnel. You will be given your finish time at the Awards Ceremony. Riders need to cross Dochula Pass by 6 pm. If not, the sweep team will pick you up. 7PM – Award Ceremony in Thimphu. All Wind Horse Guests wishing to participate in this race will be provided support in terms of gears, bike rentals , including additional support and in case of emergency. Also post or pre-trip will be arranged to fit the schedule. Guest have to plan arrival at the site at least 2 days before.